As I am getting ready to host, with fellow Albertans, a conversation about how to unleash Albertans’ collective ingenuity, I enter into an experience with diverse people interested in a collective learning opportunity.As part of this process, I will enjoy exploring the value of conversation in our communities and the role values and conversation play in our communities’ well-being. A recent conversation with a fellow learner rekindled a curiosity:How do values shape conversation? On February10-12, 2010 I am gathering with other Albertans to explore the art of hosting and harvesting conversations that lead to renewed and sustained communities.Such a conversation can not take place without consideration of the values in play – the values within the conversation, as well as the values that shape the decisions we make about how to design for conversation. Generally, the physical shape of an “Art of Hosting” conversation is the circle. We sit in circle of various sizes, we seek to collaborate as equals, we seek to unearth the collective wisdom that sits with us: we make the assumption that the information we need to know to tackle the changes we are facing resides is readily available.We each bring a piece of the puzzle, and only in deep conversation – that may or may not even be with traditional words and language – will the pieces we bring begin to emerge, and the picture we create together begin to emerge.We are fellow travelers in inquiry. In this vein, I am curious about how to create the conditions for people to fully engage with each other – at our gathering, but also out in the world.Not in a shallow, skirting converation, but in a way that reaches deep into the soul. Values come in when we meet the challenge to meet people where and how we find them, recognizing the values in play, each with expectations of conversation.I imagine these values in the form of shapes and texture of conversation, a critical piece in designing for conversation.I explore these below, first with egocentric value systems, then ethnocentric and worldcentric. Tribe – Safety and Security For the family or a collection of people supporting themselves as they survive together, the dot simply becomes larger in to a solid circle.It is a solid shape with afocus on the group as the self – the well-being of everyone ensures the well-being of each member.A solid circle, as opposed to the dot, takes into account a sense of collective, of looking after each other and a sense of belonging and connection.This is a tight-knit, solid group with a clear sense of leadership in the group (sage/elder/chief).Conversation takes place in circle form with an intense sense of belonging.There is clear protocol and deference to a leader and the spirits. Empire – Power and Action The solid circles in isolation realize that there are others competing for the same resources to meet their groups’ needs.Power and action are critical elements to meet the needs of a group – those who have proven trustworthy, are respected and revered (or even feared) rise to power.Agression, anger and shame keep individuals in check. The shape I imagine here is a solid, tall triangle.A clear hierarchy of power with power at the top.Status (power) will determine where you fit, and there is clamoring to reach the top.The conversation is “top-down” messages within the triangle. The tall solid triangle, the climax of ego-centered perspective does not contemplate the needs of others.Between triangles there is minimal conversation per se, but rather comptetive positioning, war, agreession.There is great pride and identity (of self and the group) invested in this shape.This shape snaps into place when there is an emergency. Authority Structure – Stability and Salvation The intense comptetion and fueding within and between the Power God triangles is an existence of aggression, assertion of independence and control to respond to danger.A shift from this focus on self to the collective results in order and dignity, stability and a sense of right and wrong that is established by an authority – there is “One True Way”. The shape of the tirangle again, but now with authority – there is protocol in place for the purposes of efficiency.With a purpose in mind, the pieces of the system know just what to do to respond in a timely fashion.Everyone has their place and role, and when the boss says it is time to go, it is time to.This is the shape of agencies stepping in to help in Haiti.This is the shape of the Red Cross.This is the shape of our food banks, soup kitchens and our police forces.Authority and control for the purposes of some greater public service. This triangle is less solid in texture in that it opens itself up to a broader collective purpose, but the power and hierarchy are still needed to deliver on that purpose.Communication is still “top-down”, but it is more from authority, than power.Communication between triangles, when it occurs, is filled with protocol.Other Authority Structure triangles with a different purpose/method are not tolerated. These triangles appear in isolation – or in silos as we describe our institutions. Strategic Enterprise – Success and Material Gain Eventually, the urge to connect silos and solitudes leads to strategic thinking, and a shift is made to think strategically.The need to allow for more flow around an organization is noticed.The need for less authority to let an entrepreneurial spirit emerge is also present.There is still hierarchy and protocol, but is is relaxed and purposefully allows, and expects, the interconnection of interests without the traditional rules and protocols.Ideas flow from top to bottom and bottom to top as the power is dissipated and the self reemerges – as a creative, competitive, rule-breaking self. The triangles are more stout again and no longer in isolation.They are also more porous, denoting a decrease in power and authority and the movement of information around the organization.The focus of conversation is getting problems solved creatively through the effective use of networking – people are connecting with each other in cooperation but not as equals. Social Network – Inclusive Community When the desire for material goods and gain wanes and the need to address social gaps surfaces, the shape of conversation shifts to reflect a new sense of equal human rights.Sensitivity to others is heightened. A deeper spirit of cooperation emerges and displaces entrepreneurial desire.A sense of responsibility to look after the needs of others in addition to the needs of me is noticeable. As equals, the shape is a circle, one that elicits and supports the gifts that everyone offers for the collective good.The circle is less solid than the triangles, denoting more inclusivity.This circle is also less solid than the Tribe values, again because of its inclusivity.It welcomes all, seeking peaceful resolution of conflict in support of the whole. The circle supports the full development of each individual as well as the whole.Hierarchy is not present and may be vilified. In the first collection of ego-centred shapes, I see them existing simultaneously, ultimately as self centered entities. As solid shapes, there is little room for identities beyond the identity of the entity itself.They must be so to meet their needs in the world as they experience it.As life conditions change, with more security and room for creativity, the shapes become less solid and more inclusive. 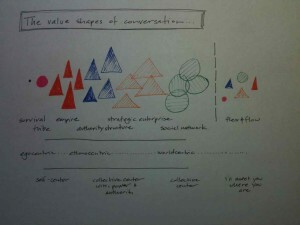 What is the impact of these value shapes on hosting and designing for conversation? Under what circumstances is it appropriate to sit in circle? Are well hosted conversations always in circle? As the purpose of conversation changes, does the shape of conversation change? In the Art of Hosting community, we make the assumption that there is great wisdom among us – we just need to release it.We must recognize that from a values perspective, this is a Social Network question that will not resonate too well with the Fire Department in the middle of putting out a fire. What values are surfacing in me? What values are surfacing in others? Is the shape for conversation I envision coming from me, or the field? Very intriguing weaving together of awareness, shapes, values, and conversation – and timely. I’m still processing, and will continue to do so during the upcoming event/experience. Glad to have these ideas to chew on! YUM. I enjoyed this “dancing” with the shapes experience…a gentle and delight-full reading and reflection for me! As we’ve talked about in the past, it’s all about learning to “meet them where they are, and then take them where they are going”.